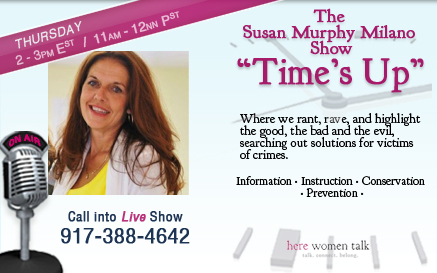 The Susan Murphy Milano Show, Time’s Up Takes on The Trio of Terror! Oh! The horror of it all! True Crime and American Horrors coming to Here Women Talk! True crime author, Burl Barer, famed attorney, Don Woldman, and the King of Scary, Hart Fisher, are going to burn up the airwaves in a once in a lifetime opportunity to take on Susan Murphy-Milano! Who knows what will be discussed, it will surely be controversial, but with Burl, Don and Hart, it’s a promise it will be entertaining! The combo of true crime, the law, and horror could go anywhere. American Horrors is an emerging international brand that produces and distributes horror content in print, video, dvd, internet downloads, streaming media and more. Hart Fisher’s opinions on serial killers and serial killer culture have been sought by numerous television producers for programs such as ABC’s DayOne, CNN’s Murder By Numbers documentary, Entertainment Tonight,Larry King Live, The Jerry Springer Show, The Bertice Berry Show, CNN Headline News, A&E’sBiography, and in magazines such as Time, Tattoo Savage, Hero Illustrated, People, The Comics Journal, the non-fiction best seller The A-Z Guide to Serial Killers and many more. Attorney Don Woldman was co-counsel in the notorious Lee Marvin “palimony” case, representing Marvin’s live-in girlfriend Michelle Triolla. His representation of many celebrity clients has helped Don create a name for himself within the entertainment industry. His first client was Hedy Lamar. As a guest lecturer all over the country, he regularly appears on TV and radio discussing family law and cohabitation issues. Edgar Award winning, New York Times bestselling author, famous broadcaster, TV star, and well known in movie theaters world wide (because he puts his feet on the seat in front of him), Burl Barer takes you behind the scenes with uncensored interviews with in-the-know cops and crime victims. Barer is best known for his fiction and non-fiction writings about the character Simon Templar, and as a prolific writer, often lends a wry, humorous bend to true-crime stories and crime novels. on Here Women Talk broadcast by Zeus Radio Network!